On March 2, people all across the nation celebrated Spread the Word to End the Word Day – an ongoing effort by Special Olympics and their supporters to inspire respect and acceptance through raising the consciousness of society about the R-word and how hurtful words and disrespect can be toward people with intellectual disabilities. Athletes, corporate sponsors, sports stars, families and more shared photos and videos on social media in support of this campaign. Dozens of Project UNIFY schools participated throughout the state of Illinois including Neuqua Valley High School. 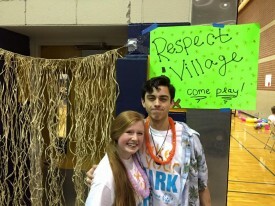 Students set up a “Respect City” on March 3 all day that ran in conjunction with the Far West Suburban/Area 2 District Aquatics Meet. Activities were planned and run by Peer Partners along with the assistance of the PE Leaders class. Neuqua’s Respect City included several game stations, like Just Dance, to keep athletes occupied during the meet while they waited for races. “It is a great way for our athletes and partners to come together to be Unified on that day,” said Kim Pehlke, Instructional Case Manager/District 204 Special Olympics Coordinator at the Neuqua Valley Main Campus. Their Respect City also featured an R-Word signing table with partners encouraging all to take the R-Word Pledge. Pontiac Township High School, a Special Olympics Project UNIFY school, has been actively involved in R-Word activities for the past seven years. Students held an annual R-Word pledge drive, a grade school poster contest which received 660 entries, a community pledge drive at Dairy Queen where people got a free Dilly Bar for signing the pledge banner and a “What’s Your R-Word?” photo booth for the student body to dress up and display positive r-words like respect, reliable, radiant, remarkable; photos were then posted in the cafeteria. All of the students’ efforts culminated in an all-school assembly on March 2. They debuted their newest video, “Good Feelings,” which features students and community members and an original song written and performed by Thomas Baumgardner. The video was produced by Pontiac senior Blake Whittle. Guest speakers at the assembly were Holly and Nate Simon of Chicago. Holly Simon became a fierce advocate for those with intellectual disabilities after her fifth child, Nate, who is now 13, was born with Down syndrome. Holly founded the I AM WHO I AM foundation, a nonprofit organization, to educate and bring awareness for these amazing children. At Pontiac Junior High School, a Peer Partner student read a message about respect on the announcements each morning during the week, and on March 2, an eighth-grade student with special needs spoke at the beginning of each lunch period about respect and how it feels to him when others use the R-word. 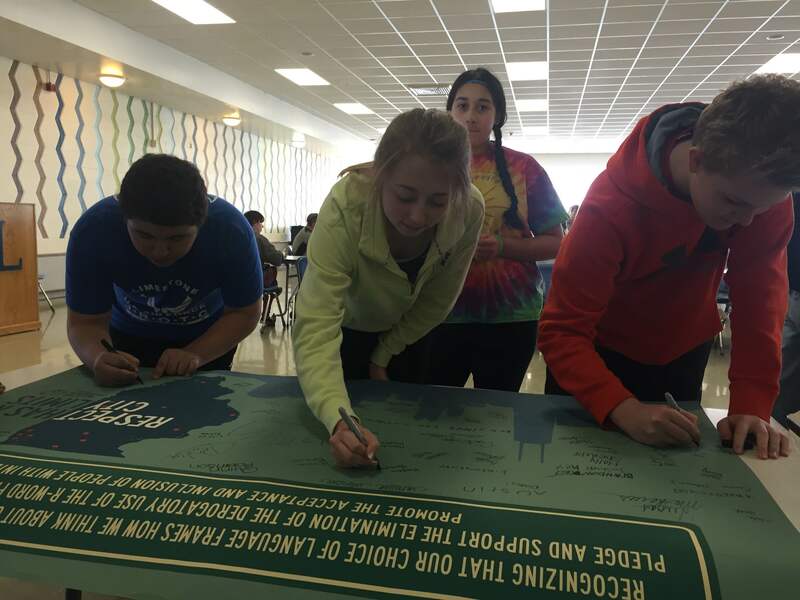 Junior high students took the pledging online not to use the R-word during lunch and those who pledged also signed the school’s Spread the Word banner which will be hung and displayed in the commons as a reminder of their pledge. Junior high peer partners and special education students also attended the assembly at the high school. Many schools will continue their Respect City celebrations through March and into April. Edwardsville High School held an R-Word pledge campaign earlier this month as well as a Unified Kickball Game. Later they’ll hold a quarter auction to raise money for their Project Unify schools. Their National Honor Society will host a Unified Field Day and Student Council will host a Unified Prom. Woodland School in Edwardsville is holding its Respect campaign in April and will include students taking the pledge, sharing R-Word videos created by high school students, making cheer posters for Special Olympics athletes competing at Area 12 Spring Games and in May, students with disabilities and their Peer Partners will play an exhibition kickball game against the student council. The annual day of awareness is held the first Wednesday of every March. While most activities are centered on or near that day in March, people everywhere can help spread the word throughout their communities and schools year-round through pledge drives, youth rallies and online activation. Respectful and inclusive language is essential to the movement for the dignity and humanity of people with intellectual disabilities. However, much of society does not recognize the dehumanizing and exclusive effects of the R-word. The campaign, created by youth, is intended to engage schools, organizations and communities to rally and pledge their support and promote the inclusion and acceptance of people with intellectual and developmental disabilities.